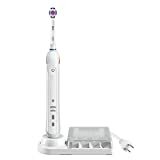 There is no disputing it, electric toothbrushes put some oomph into oral hygiene. And whether you would like some extra cleaning power or need some dexterity assistance, the perfect electric toothbrush is out there for you. To help you narrow down your search, this shopping guide will give you all the information and tips you need to make a smart electric toothbrush choice! 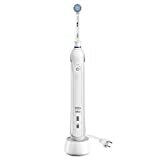 Sonic Electric Toothbrushes: These quality electric toothbrushes have vibrating brush heads that move back and forth. With up to 40,000 strokes per minute, they are the closest to a professional clean you will get without visiting the dentist! 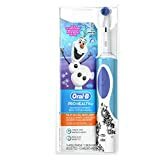 Oscillating or Rotating Electric Toothbrushes: The brushes on these toothbrushes quickly rotate, alternating directions, and some even offer bristles that pulsate for an extra scrub. They are an economical choice offering up to 8,000 strokes per minute to ensure a perfect brush. 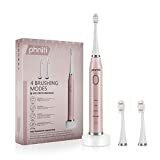 Design: Electric toothbrushes that are not only easy and comfortable to hold but have brushes and brush heads that fit seamlessly together (preventing space that would harbor germs or bacteria) are crowd pleasers. Replacement heads: Owners who can easily find the replacement head for their brushes, in the style and type they need, value their electric toothbrushes much higher than those who don’t. Checking head varieties and types of brands before purchasing will avoid disappointment later on. 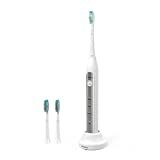 Vibrations: The more vibrations that are offered, the better your electric toothbrush will clean. 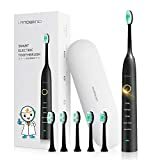 This is a top concern among reviewers, and electric toothbrushes that offer a high vibration per minute for a reasonable cost are better rated. Make sure your prospective new electric toothbrush carries an ADA Seal of Approval, which certifies that it has been safety tested. Electric toothbrush heads, like their manual counterparts, need to be replaced every three months. Before deciding on a brand and model, see what replacement heads they offer (for sensitive teeth, deep cleaning, or any other personal needs) and the replacement costs. Knowing cost and availability will save you from disappointment and hassle after your purchase. Buying an electric toothbrush for the kids? No problem. Brushes designed for kids come with a host of features to help keep your child’s teeth healthy. Features such as different power settings for different ages, shapes that are less likely to roll, easy-hold grips, and fun music that plays for 2 minute time - the amount of time they should be brushing - and all make brushing easier and more enjoyable for your little ones. Some electric toothbrushes will include a feature that beeps or turns off after two minutes of brushing time is up. Others will beep every 30 seconds so that you can work on the four areas of your mouth equally. Both are convenient features that help maintain optimum brushing habits. For sensitive teeth, opt for a higher end electric toothbrush with brushes specifically designed for sensitive teeth to ensure a comfortable brush. You may also consider brushes with pressure sensors, that indicate if you are brushing too hard. 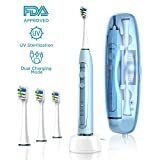 Extra features that can make your electric toothbrush more versatile are gum stimulation massage settings, a display showing charge status, and a travel case. Philips: Philips is a Dutch company headquartered in Amsterdam. A Philips Sonicare toothbrush makes more strokes in two minutes than the average brusher does with a manual toothbrush in a month. Waterpik: Waterpik has acquired over 500 patents in the 50+ years they have been in business. Their electric toothbrush and water flosser systems are come of the most complete home-level dental care products on the market. Oral-B: Oral-B began in 1950 and their toothbrushes are used by more dentists worldwide than any other brand. Many of their electric toothbrushes feature built-in pressure sensors, to prevent brushing too hard. The ‘B’ stands for Brush. HealthPro: HealthPro is a provider of health monitoring, therapy and disease prevention equipment. They are committed to keeping electric toothbrushes affordable by pricing their replacement heads at under $2/ea.